At the end of September, Stampin' Up! held a Creative Tour seminar for Demonstrators in the S E Region.It is always a wonderful opportunity to exchange ideas with other demonstrators by swapping card fronts. It was very much touch and go as to whether or not I'd have any swaps done. As time was at a premium, I had to keep the design quick and simple and here's the result. 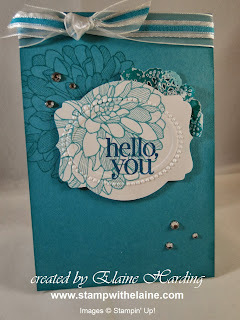 I used Bermuda Bay and Whisper White cardstock. The stamp set is Regarding Dahlias from the Annual Catalogue. The image was stamped twice, once on Bermuda Bay and the other on Whisper White. The Whisper White image was die cut with Deco Labels and embossed with the Designer TIEF. The lace doileys were cut into quarters, inked and attached in the top right corner and to finish it off, some rhinestones added in the bottom right. Then to illustrate a stepped up version on a normal card, just additional rhinestones and some Whisper White organza ribbon with Bermuda Bay running through the middle.